Metamaterials are composite systems whose properties are dominated not by the individual atoms, but by the properties of larger, artificially produced structures or "meta-atoms." The most famous types of metamaterials are those in which the interaction with light is markedly different than in conventional materials: in some cases the index of refraction which determines the speed of light can even be negative-light bends in the opposite sense from common experience in these materials! Possible applications are invisibility cloaks, and aberration free lenses. 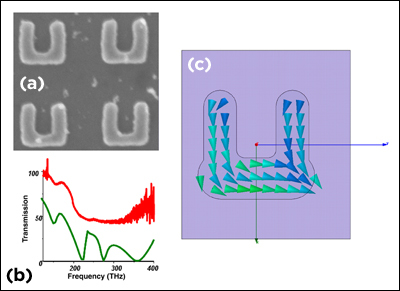 Most metamaterials gain their novel characteristics through the existence of resonances in the component artificial structures: these can be oscillations in the electron density or atom density which occur at some natural, tunable frequency. Fig. 1. Metamaterial structure consisting of U-shaped silver nanostructures on a glass substrate. Bottom left shows measured light absorption spectrum for normal incidence in red, calculated spectrum in green. Right panel shows simulation of oscillating electron current for the resonance at 230 THz. From T.D. Corrigan, P. Kolb and R. J. Phaneuf, unpublished. A good example of such a resonance occurs in small metal clusters, and is called a particle "plasmon": the sea of electrons can be made to swish back and forth with respect to the cluster of atoms; by immersing it in an oscillating electric field. The amplitude of the swishing will be very large if the frequency of the oscillating field matches the plasmon frequency, which is determined by the dielectric function of the metal and that of the surroundings, as well as the size and shape of the cluster. This is the origin of much of the brightly colored glass that is used in stained glass windows, by the way: adding metals to glass results in the spontaneous formation of nanometer sized clusters of metal which absorb light very strongly at their plasmon frequency. 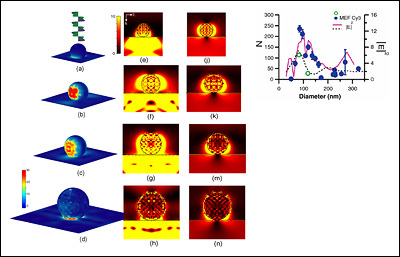 Metamaterial structures based upon particle plasmons have important technological applications in enhancing the spectroscopic signature of nearby molecules, such as fluorescence and Raman scattering. In fluorescence a molecule is excited by absorption of light at one wavelength and relaxes by emission of light at a slightly longer, and characteristic wavelength. It is one of the workhorse techniques in biomedical assays, and is used in the detection of a number of important or potentially dangerous biomolecules including proteins, DNA and RNA. Work by Dr. Ray Phaneuf and his group in has shown that by carefully choosing the size, shape and spacing of silver nanostructures and the type of substrate, that fluorescence can be enhanced by at least a factor of a few hundred, greatly increasing the sensitivity to small amounts of target biomolecules. How else is MSE @ UMD Working with Metamaterials? Our metamaterials work is considered some of the best there is! Recent publications by Professor Ray Phaneuf and his research group have been featured in special compilations that keep materials scientists informed of cutting-edge and state-of-the-art research. You can read more about their discoveries here and here.